Economy Model! 15" wide tower display with 5mm thickness glass for affordable price point! Hidden wheels allows for easy moving of this cabinet within a store. Cabinet and shelves are made of tempered glass for a safer alternative to traditional glass. Glass door includes lock to keep items secure and accessible to key holders only. Matte black laminate gives the medium density fiberboard base a contemporary style. The narrowest tower showcase available here; perfect for adding a few more items to stores with limited floor space. 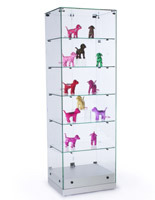 This glass showcase, tower display that has fixed height glass shelves provides 5 levels for placing items. This cabinet includes fixed height shelf pins that provide ample room for merchandise. 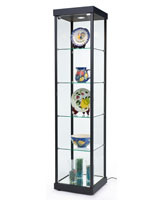 This tower display that is 71" tall has hidden wheels underneath the base to easily move. The hinged swinging door requires approximately 17" of space to open. This retail tower display has an elegant frameless design inspired by European style for an unobstructed view of merchandise. The tempered glass is safer than the annealed type and stronger. 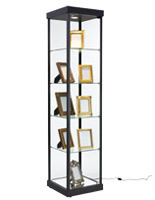 This tower display is economically priced and the most affordable style yet! 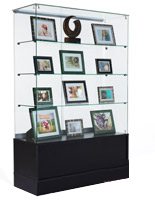 This glass cabinet is great for showcasing jewelry, clothing, trophies, glassware, artwork, historical artifacts, and more! 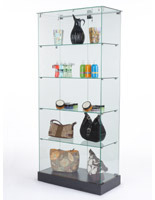 This glass tower display, also known as a merchandise trade cabinet, ships unassembled to reduce shipping costs. See assembly video below or paper instructions for a how to guide on assembling! 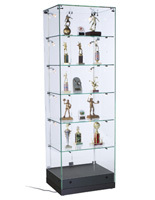 This tower display that is made of tempered glass is sleek and stylish. This showcase is made with a black wood laminate over an MDF (medium density fiberboard) base for reduced costs but a style that looks as great as real wood. 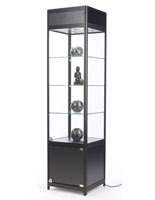 This tower display includes a hinged glass door with lock and keys to ensure that only store employees have access to expensive or breakable merchandise. This retail trade cabinet is a fraction of the cost of comparable models but still provides the same great features. This tower display is 15" wide by 71" tall. 15.0" x 71.0" x 14.8"
Easy and quick to put together. Great product! Love the wheels! It would be better if it had lights. Unfortunately this product does not come with lights. If you thought it did and would like to discuss returning this item, feel free to contact our customer care team via phone, chat, or email and they will be happy to assist you. 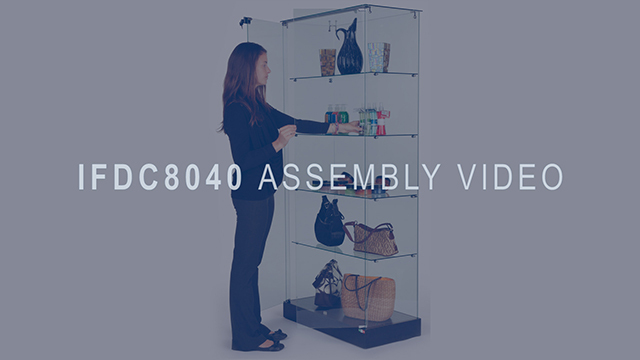 While not the same size, we do offer other frameless black display cases in this style, such as this one: SKU# GTEC24LEDB. It is very similar but slightly larger. Our customer care team can also assist you in ordering this item instead if you choose to do so. This one also is a similar style and approximately the same size. It offers either LED or halogen lighting, however it is not frameless: SKU# LEDSMP01SV. Ulymar Rocha's review was unhelpful. A review is about the product purchased and not about what it came without. This is like purchasing a sleigh bed and complaining because it didn't come with four posts. Posted 2 years ago by Danielle A.